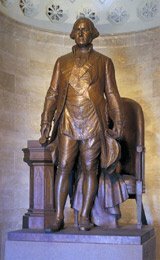 George Washington Masonic National Memorial is dedicated to the memory of George Washington, a president and a Mason. George Washington belonged to Alexandria Lodge 22, and was named the lodge's Charter Master in 1788. Records of Washington presiding over the lodge are non-existent, possibly due to a fire at the original lodge's location in Alexandria's City Hall, which is where the lodge met until moving to the memorial in the early 1940s. Constructed between 1923 and 1932, it is located in Alexandria, Virginia atop Shooters Hill (named after a union fort on the same location) and affords views of Alexandria and Washington, D.C. to the north. It is near the King Street station of the Metro. The George Washington Masonic National Memorial is the only Masonic building supported and maintained by the 52 Grand Lodges of the United States. This is counter to common Masonic practice, where a building is only supported by the Grand Lodge of the state in which it resides. The building also houses the collection of the Alexandria Lodge, which contains most of the fraternal artifacts of George Washington, including: Watson and Catsoul Apron, Sash, Past Master portrait, Working Tools and Trowel used to lay the cornerstone at the United States Capitol.